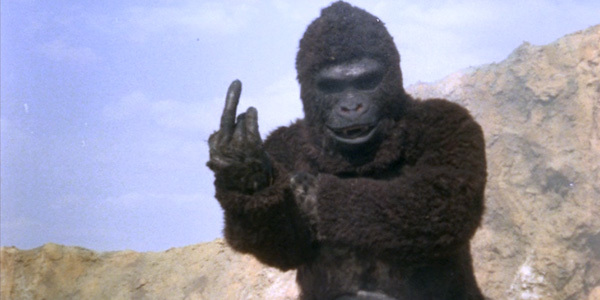 A giant gorilla destroys Seoul in this cheap Korean version of "King Kong." It also kills a harmless basking shark, wrecks a polio vaccine factory, and flips the bird at the audience. That monkey is a menace. Attack of the horny gorilla! I wish I could get my hands on a 3D copy of this. I think it'd be a real hoot seeing all those lousy effects flying at my face in THREE DIMENSIONS! Good review, awful movie. It has so much potential yet it fails at delivering the goods. Very good and very funny. I'm adding this to the list of movies I have to see. Interestingly enough, I saw that this film was on Bottom 100 Movies on IMBD. From APE to The Host. Korea, you've come a long way baby! Mimi Leder went on direct the likes of ER, China Beach and Deep Impact - Reuben Leder went on to write for Magnum, p.i. and Flipper (the mid-90s version with Jessica "Always hot, even when underage like she was here" Alba). See what you can do when you try? Considering the quality of the rest of the film, a 3D version would probably give you a walloping big headache. The rocks being tossed at the camera were especially bad. Boulders on a zipline! It's pretty darn awful, but that surprises me as well. Did MST3K ever do this movie? I do not believe that they did. The reason I ask is that the bottom 100 seems to be filled with MST3K films. Mimi seems to have been gaining experience while making this film, and did go on to be moderately successful. I don't know if I would call "Deep Impact" a great success, but it was a big Hollywood movie. As for Reuben Leder - have you ever watched "Magnum PI?" It's a show about a moustache driving a Ferrari around Hawaii. I don't believe they did look at this film. Too bad as well, probably make one heck of a good riff. The movie isn't on the bottom of the list anymore, it seems to have given away to much more deserving pieces of crap. As for Reuben Leder - have you ever watched "Magnum PI?" It's a show about a moustache driving a Ferrari around Hawaii. I'm supposed to be ill, but that made me laugh out loud. Coca-Cola all over screen: no problem. Thanks, Andrew and for the nice PM as well. I saw the clip. Pretty darn sad. Is the ape giving the one finger salute? I wil have to try and watch this. Having had the misfortune of seeing the 1976 version of "King Kong," I'm glad to see that I was not watching the worst giant ape film released in 1976. Not only did I howl my way through this flea-bitten flick, but I learned that my mother had a taste for cheese, as well....she was sitting right next to me on the sofa! At the time (1986) this may have been the absolute WORST film I'd ever seen. In those days, Channel Nineteen in Cleveland seemed to specialize in obscure, rancid films.